Hi! Remember me? It came to my attention recently that I had not told you all where I was going when I moved my blog! WHAT?!!! How could I have forgotten! I have enjoyed blogging sooo much and after a prolonged absence, started blogging again at KathysPaperMoon.com. Please come to visit me there! 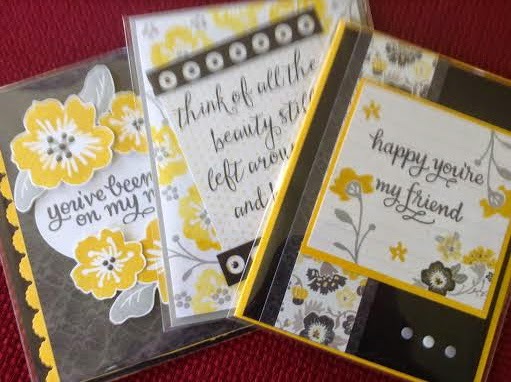 Monday is Card Ministry 101...quick and easy cards using just stamps, ink and paper. Wednesday is What’s for Dinner Mrs. Skinner...recipes that are gluten-free and either vegetarian or vegan. Friday I am thinking will be My Favorite Things ranging from food to clothes to craft projects to kitchen gadgets to books...oh my! I plan to add two more days a week as soon as I can. I also plan to participate in the Blogging A to Z Challenge for the month of April. Thank you for checking out my new blog and for the love you showed this one for several years! See you soon at KathysPaperMoon.com! Hello and Happy Monday to you all! This day has just zipped right away and here it is after 5:00 before I am getting the Happy Homemaker Monday done. Last month I was toiling away trying to get all our tax figures ready for our tax accountant and was fussing and fuming and super cranky! I decided right then and there that I would keep up with the tax stuff quarterly so as not to lose my mind trying to do it in February...or March. Today was the day and after 3 hours of figuring I finally have it finished for this quarter...Yay!!! 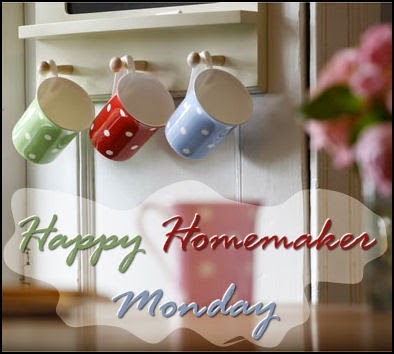 So, better late than never, please join me as I update you on my life via Happy Homemaker Monday hosted by the very busy and moving again Sandra at Diary of a Stay at Home Mom! I have lived in the same house for 20 years and I can't imagine what it would be like to have to move. Besides, decent, affordable housing is hard to find. Please visit Sandra and cheer her on! It is currently 58 degrees and seems like that has been the temperature since about 11:00 today. It is cloudy and just a bit breezy but not windy. Today was my Intermittent Fast Day so no breakfast. However, for lunch we had some delicious asparagus picked right from our garden! The store bought stuff does not even compare! Wilson demolished a lily plant in the flower bed:( He really doesn't know any better and unless we catch him in the act it's hard to get after him for it. It's very cloudy and looks like we might get rain later tonight. Just finished my tax stuff for the quarter so am "relaxing" by writing this post. Dining table looks good for the 2nd week in a row:) Dog toys all over the living room but the dogs are in the dining room with me. Piles of laundry need to be done--I got one done today and will do 2 more tomorrow. We watched the best movie I have seen in a looonnnggg time this weekend. It's called The Hundred Foot Journey and was amazing! No menu...winging it as usual! However, my new favorite food blog, It Doesn't Taste Like Chicken has 10 Vegan Dessert Smooties that I want to try...well, I want to try 8 as 2 of them have peanut butter in them and I am allergic. Thanks for visiting! I will be back tomorrow for Tasty Tuesday with a delicious recipe for you! Masculine cards are hard for me but hey, guys have birthdays too! 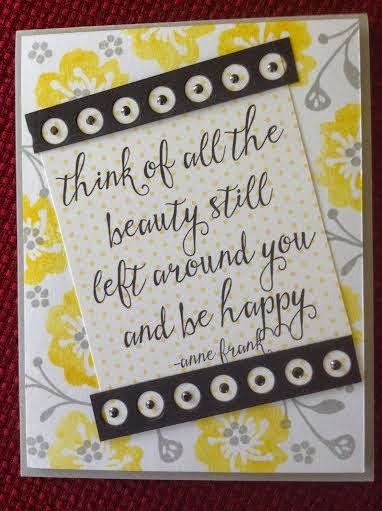 So I scoured Pinterest for a card I thought might be good for our friend Jim! 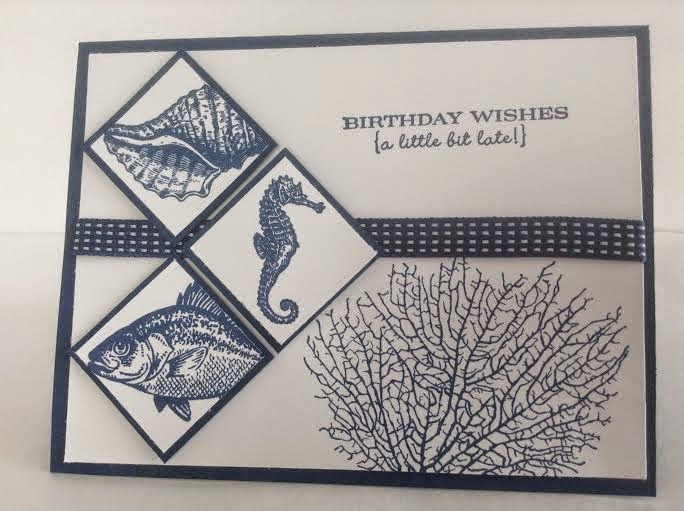 He and his family had just been to the Oregon Coast for Spring Break so this card by Beth Ann Wilson from Beth Ann's Stamp Pad Creations seemed appropriate. It looks like Beth Ann is no longer making and posting cards but she deserves credit nonetheless! For this card I pulled out a retired color...Midnight Muse! After yesterday's post I thought I should keep this one short and sweet! I hope you have a great weekend! Thanks for stopping by! Yesterday was one busy day but a fun one. First up was my dental cleaning...not so much fun...but the hygienist said all looks great at 8 months following my LANAP procedure the middle of August! And I have felt sooo much better since a few months after the procedure...more energy and better immune system! After my teeth were sparkly clean we went to lunch. I know, doesn't make sense to dirty up those pearly whites right after but I was sooo hungry!!! Next on the agenda was Joann's...it was Senior Citizen Day with a 20% discount on just about everything. Could I find anything? Well, not much, but I did find embossing folders (reg. 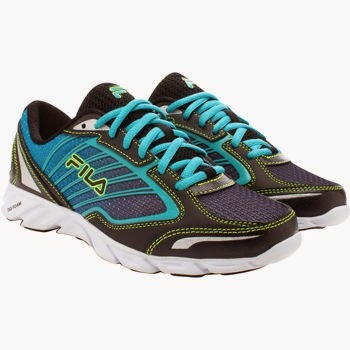 price $3.99-4.99) for 5/$10!!! The best part was a pedicure with my favorite technician, Joyce! She is amazing and such a sweetheart. I hadn't been since last Fall so it was definitely time! Hubby picked out the color to debut my pedicured sandal feet for Spring; OPI Romeo and Juliet! I love the names OPI gives their polishes. I had picked out Chocolate Moose (yes, I spelled that correctly) but went with Hubby's choice and love it!!! Today I had an online class through Creative Live on Beginning Mixed Media. Creative Live posts some classes that are free while they are live but once the class is over you can purchase it to watch over and over for $39. This was a 3-hour class and the instructor was amazing! I don't do Mixed Media (yet) but have been curious about what it is all about. I would like to combine it with Art Journaling, which I also haven't started...yet! The card for today I call Wondrous Wreath for Spring! 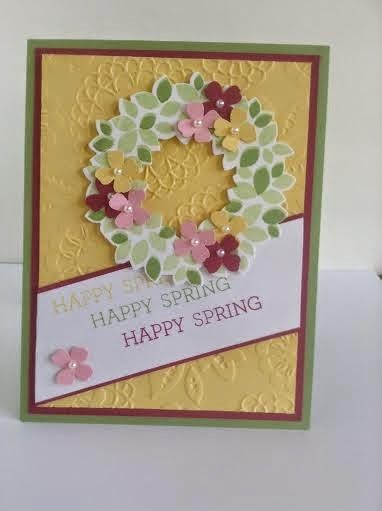 Doesn't this card just scream Spring?!!! The Wondrous Wreath was in the Holiday catalog and carried over to the Occasions catalog. I do hope it makes it into the new Annual Catalog starting in June! 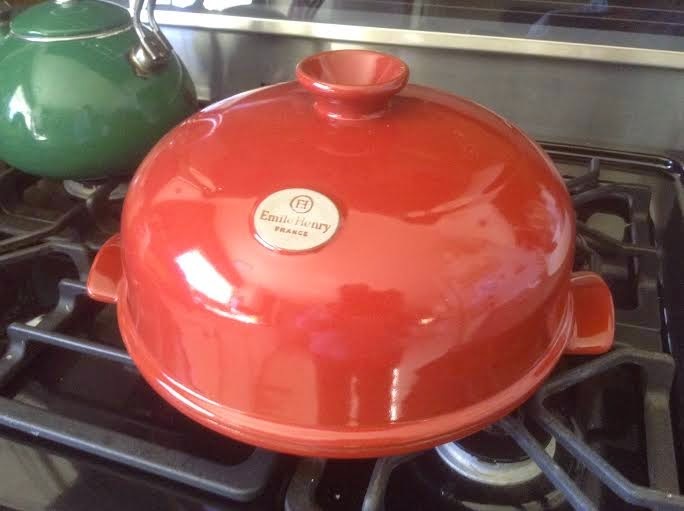 I used it for Fall, Christmas and now Spring! It is so versatile! 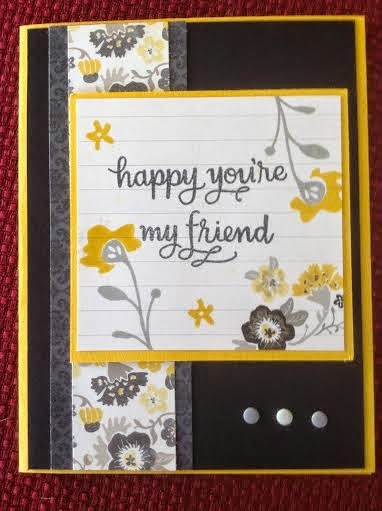 I found the inspiration for this card on Pinterest and my thanks go out to Amy Koenders of Stamp with Amy K! I switched it up just a little but not a lot! I have some Purely Pomegranate cardstock that I squirreled away when it retired a few years back and thought it would be perfect with this card paired with Wild Wasabi and the combo did not disappoint! Don't forget that Stampin' Up! has FREE SHIPPING through tomorrow, April 10 and you can get there by clicking on the shopping cart on the right! That's it for me today! I hope you are having a great day and that the sun is shining where you are. Last week I shared with you 3 cards I made for a swap that was to include 3 different cards made from one stamp set. Well, the cards above are what I received from my dear friend, Margarita! 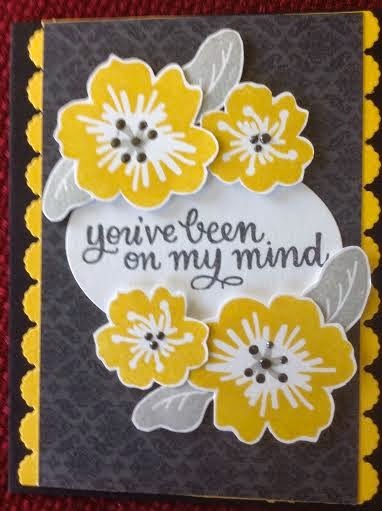 For these cards she used the March kit from Simon Says! I love the yellow, black and gray! Since I photographed the group with their plastic sleeves on, I thought I would give you an up-close-and-personal look without the plastic! May I say gorgeous?!!! 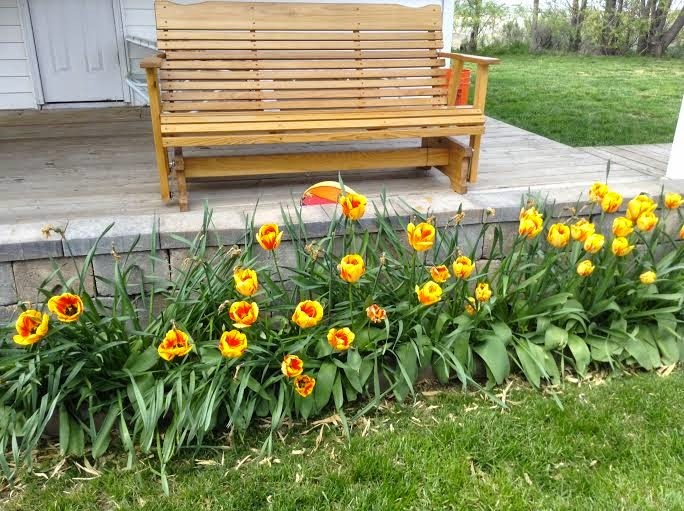 Look at those beautiful yellow blossoms! And this one is my favorite! Thank you Margarita for these beautiful cards! Love them!!! Welcome to Tasty Tuesday! I have a very tasty treat for you today! First off, I would totally flunk in the school of food photography! Now that I look at it, I should have piled the rice on a plate and sprinkled with parsley...or something! Maybe I will get some tips from my niece Mindy about photographing food. Well, I hope it doesn't take away from the fact that this was truly the best rice I have EVER eaten! We used to buy Near East Rice Pilaf but one day I went to make some and there was only ONE box! One box for this family just doesn't cut it so off to the internet I went to Google "Near East rice recipe". Bam! Up comes this recipe for Copycat Near East Rice Pilaf! Not only is it super easy and takes only 20 minutes, but it is seriously delicious! Erica is a food genius!!! As usual, I made just a few tiny modifications for our tastes but nothing serious! Bring broth, water and butter/oil to boil in a small pot. 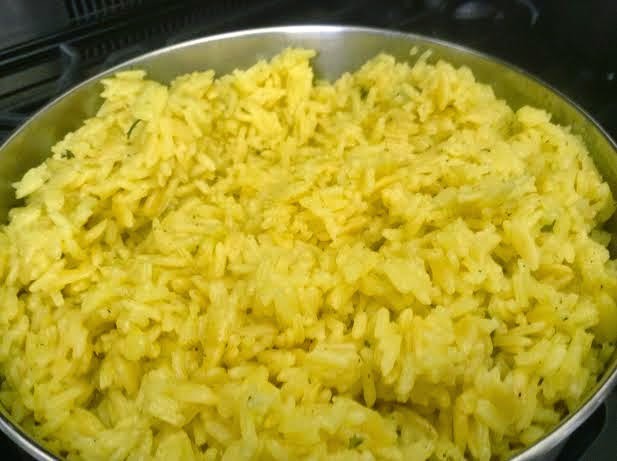 Add rice, orzo and spices and return to a boil. Reduce heat and simmer until rice is tender and liquid is absorbed, about 18 minutes. Erica has a printable version of this recipe on her blog plus a lot of other great recipes. At 4:00 in the afternoon, it is 58 degrees (F) with blue sky and fluffy white clouds. We have a slight breeze that makes the wind chimes tinkle but not clang like they were doing all last week. Actually a very beautiful day! No breakfast today as Mondays and Thursdays are intermittent fasting days which means I eat one meal between noon and 1:00 that consists of approximately 500 calories. That's it...along with plenty of water! I see the bird feeder is empty but there are so many other things for the birds to eat right now. I also see lots of green accented by the beautiful red Barberry Bushes. Out my side window I see the lilacs starting to bloom and they are gorgeous! Sitting at the dining room table which amazingly is cleaned off, with the dogs at my feet (as usual). I just finished my glass of water so need to get up and get another one before I continue. The living room is littered with dog toys! Wilson is the worst about the toys...if they are in the toy box, they need to come out! But he so funny doing it! Hubby decided he wanted to turn his chair around so he can see the view out the front window...looks really interesting. My chair was turned around too but Wilson doesn't like it because there's not enough room for me to play fetch with him when it's faced that direction. I don't have a menu again this week:( I do have some recipes I want to try from this fabulous vegan blog called It Doesn't Taste Like Chicken. Samantha Turnbull is hilarious and her recipes are delish! Look out family!!! Well that's it for me this fine Monday! I will be back tomorrow with a recipe for Tasty Tuesday!